Shoshone Sheet. 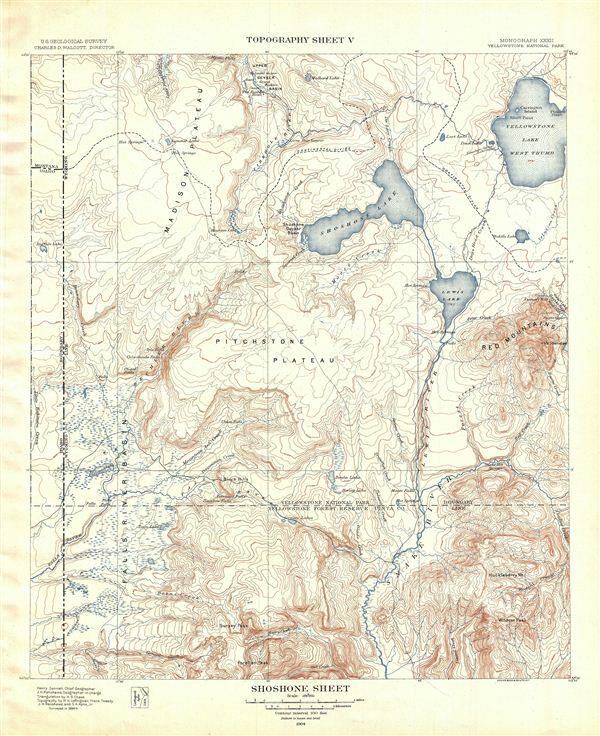 Topography Sheet V.
A fine example of Arnold Hague's 1904 topographical survey map of the spectacular Shoshone Region in Yellowstone National Park, Wyoming. Centered on Pitchstone Plateau, the map covers from Snake River northwards, along the river, to Shoshone Lake and Yellowstone Lake's West Thumb as far as the Upper Geyser Basin (and the famous Old Faithful Geyser). The four major rivers, Belcher River, Boundary Creek, Mountain Ash River and Fall River, that start at the Madison and Pitchstone Plateaus and carve canyons through the park's southwest corner are shown here. Throughout countless well known Yellowstone sites are noted, including the Falls River Basin, Madison Plateau, and the Red Mountains, as well as various rivers, lakes, creeks and springs. The boundary line between Idaho and Wyoming runs along the length of the map on the left side. On the lower part of the map, the boundary line between Yellowstone National Park and Yellowstone Forest Reserve runs along the breath of the map. This particular map was part of Hague's study of the regions unique geology and the related geothermal activity. Published by the United States Geological Survey in 1904.